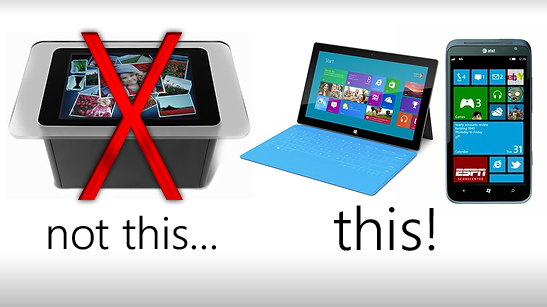 Microsoft had two conferences recently, one about their new Windows 8 tablet called the Surface (not the table! ), and the other about Windows Phone 8. Both of which I’m really excited for. The Surface looks like a really nice piece of kit. It’s a smart move by Microsoft as they now have a first-party product to compete with Apple’s iPad but also fill the place of a small laptop alternative. The features looks really promising - a good screen, a clever keyboard cover and a USB port. I’m thinking it could be a really useful machine. I would love this tablet for University to take notes during lectures as I’m using pen and paper at the moment and it’s a bit of a pain; quite literally for my writing hand. I’m not looking forward to the price though, the power and quality they talk about sounds like it could be quite expensive. While I’m still unsure on using Windows 8 day-to-day, developing apps for it seems really appealing to me; a large user base and lots of new screen real estate for the beautiful Metro UI. Windows Phone 8 is also looking good. I’m not sure if I like the new start screen that much, it looks a bit cluttered with all those different live tiles moving about. It could be difficult to pick out the information it’s trying to show you. It is however customisable so you can have it any way you want, which I like. There’s more power and languages but it’s essentially the same developing experience we’re used to. I will probably only develop for it if I get a phone myself, as I know there can be a big performance difference between the emulator and the real thing.